What Is the Purpose of Cable Protectors? Cable protectors are products that are made to prevent wires, pipes or hoses from being stepped on, tripped over or driven over. They are either hump or ramp-like fixtures that have spaces underneath them, which are capable of holding a number of cables. 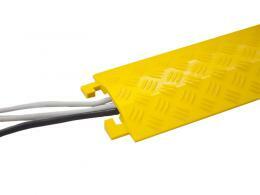 We have protectors that can handle four or five cables and some that are able to hold just one. These protectors are invaluable to those who have spent money replacing their cables over and over again. Instead of risking damage to wiring that gets used in your shop or at work, simply install a cable protector over them and never have to worry about it again. Many people step on the wires in their workplace and cause kinks that prevent them from working normally. This can be a big hassle, especially if the cables have to run through a doorway to the device they’re plugged into. 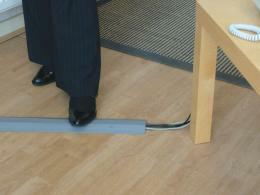 It’s also common for people to have cables on the ground at their place of work. 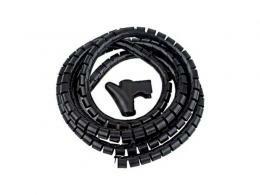 If there are vehicles coming and going all the time, then it’s crucial to have quality cable protectors installed. Where Can the Cable Protectors Be Used? 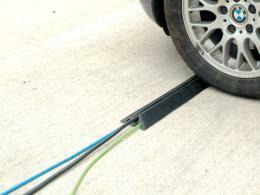 The cable protectors can be used in a number of different places. They will most commonly be found in a workshop or warehouse where there are a number of cables and wires on the ground throughout the establishment. They can also be found in an office that makes use of cables for office equipment and other things - a cable tidy would come in especially handy here. Our light duty rubber cable protector is a budget solution to the problem of health and safety hazards in offices and other workplaces. In addition to protecting the cables they are covering, they can also help to keep them separate and prevent any tangling from happening. This is great for people who need to keep their wires secured and may need to move them in the near future. Nobody wants to deal with a tangled mess of cables if they don’t have to. 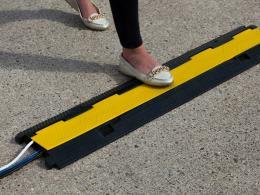 The wide range of cable protectors we offer are made out of a durable polymer that will not break if they are stepped on or driven over by a vehicle. They are guaranteed to last for a long time, which is why we offer a one year parts and labour warranty on all of our cable protectors.